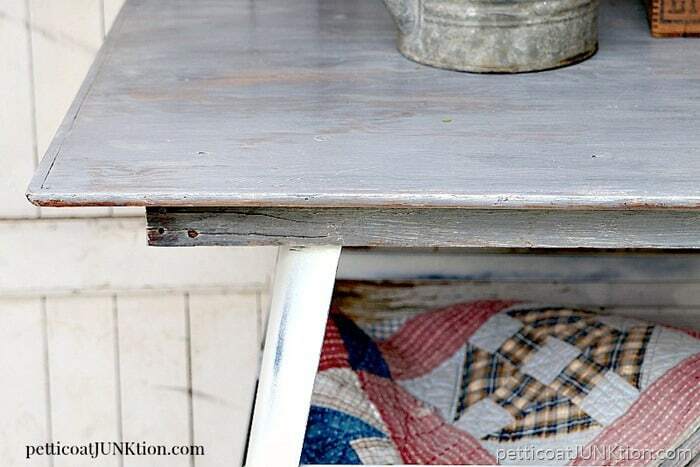 I have a sweet tutorial on the weathered gray wood finish I gave the reclaimed table the JTS put together for me. Welcome to another fun themed furniture tour. Today’s theme is “neutral”. That means the field is wide open. I went weathered gray and white for my project. 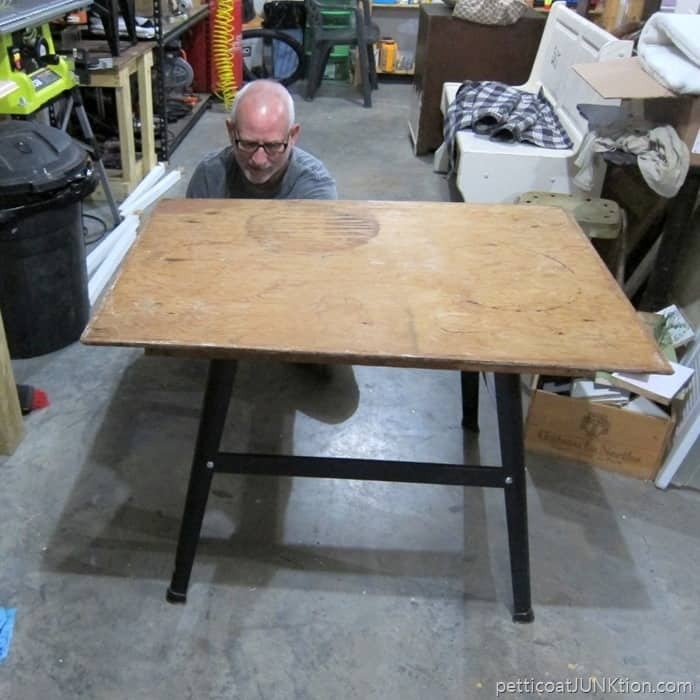 Do you guys remember the $2 auction table the hubby and I repurposed into a table with a solid wood top and a metal base? The table is sooo much better now. No little spindly legs. The table looks like this now. I tried to give the top a weathered wood look and I think I achieved it. Of course, the process involved a lot of trial and error. I wouldn’t know what to do if a project came together perfectly. I will share the entire makeover details next week. I used a handmade quilt from my collection, pretty flowers in a beat up watering can (usually on the dining room table), and other things from my junk stash to stage the photo. I keep the gates/doors handy for staging. There are 3 of them and they are heavy. I have to set them up each time I get ready to take a photo. Another look at the weathered gray wood finish. Now it’s time to see what my friends have for us. Click the photos below to see the projects. Have a great weekend!! Such an amazingly beautiful table! Love that distressed top. 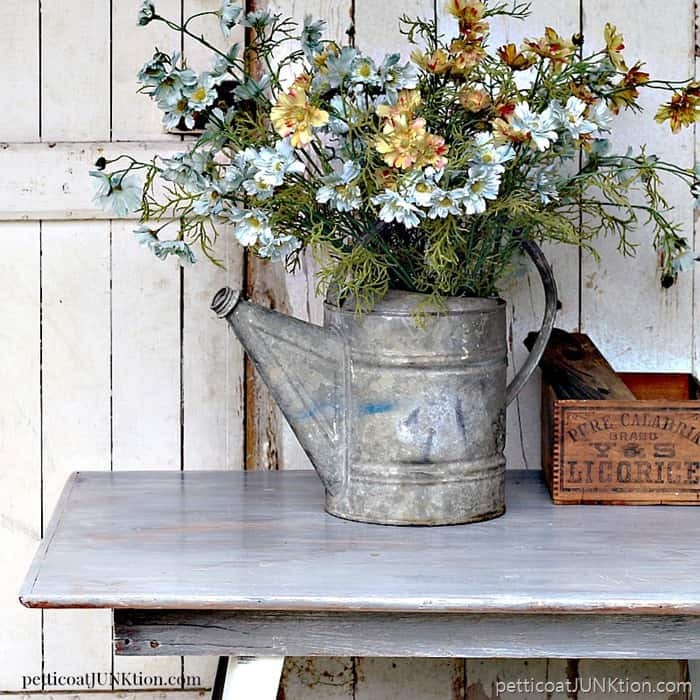 I love the weathered gray finish, Kathy – and your photos are beautiful! I’m totally digging that weathered finish – can’t wait to read about how you did it!! Nice look and I am crazy for the licorice box! Oh my that is beautiful ! We’re did you ever fine such a awesome husband ! You make a great team ! He is awesome! Thank you! Love that finish, it’s beautiful! 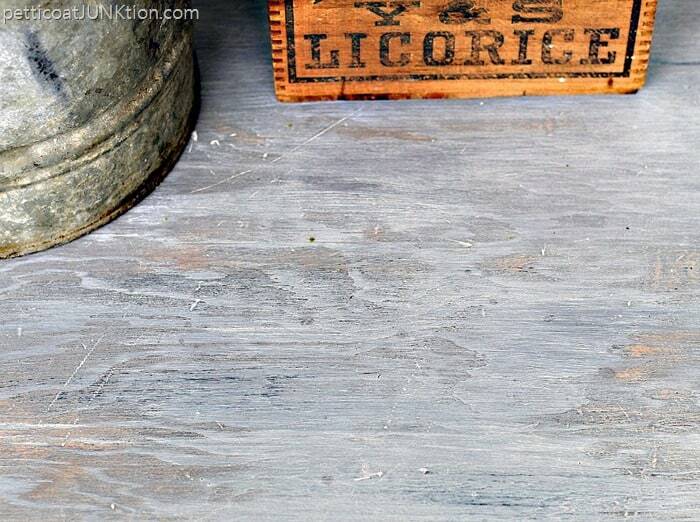 Yes, I think this is The perfect weathered gray wood finish! Really like your table, you did a great job! I need a backdrop like yours. It’s challenging to take pictures of furniture with a dark house like mine. Your table is charming and I love the finish you gave it. The watering can looks perfect on it. Beautiful, I love the look. 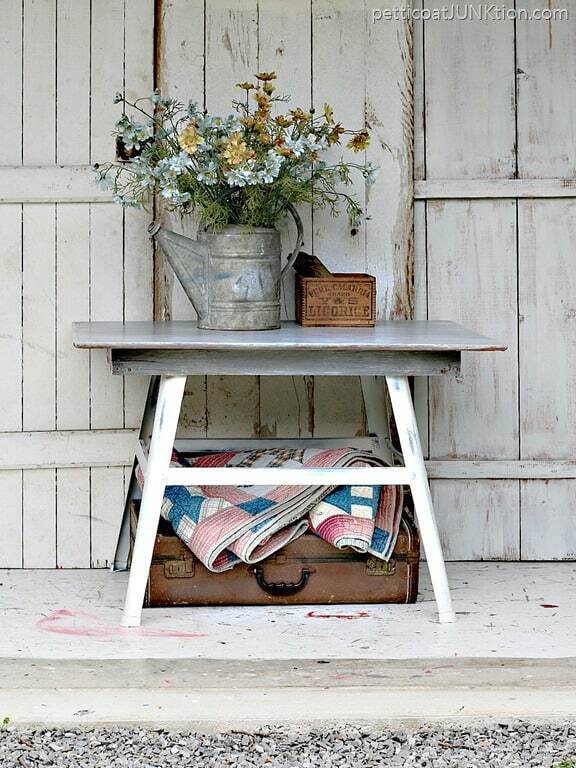 So charming and homey looking. Wowsers Kathy, you’d never know that was the same table! Trial and error or not, you nailed the weathered top look. It has so much charm – love it – pinning – sharing – swooning. 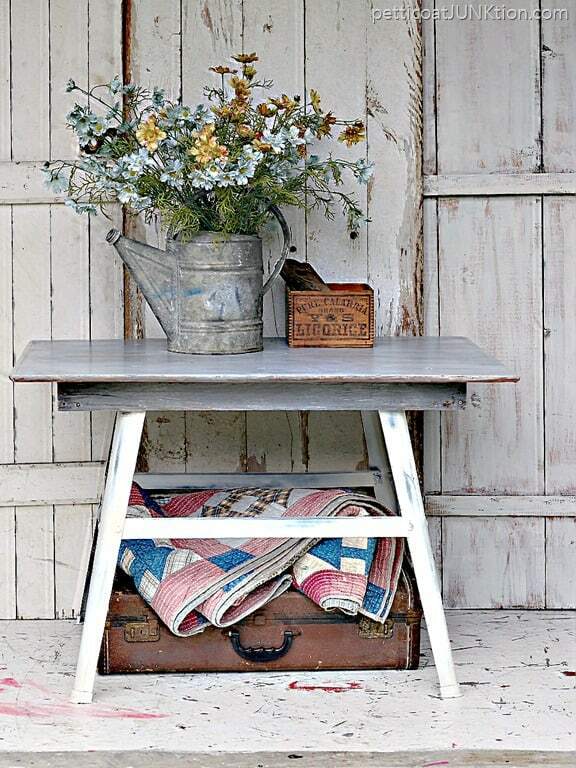 Love the weathered look and your staging is gorgeous as usual! Kathy, That looks fabulous. I too never would have known the legs were metal! Great project! I wouldn’t have known it had metal legs from the pictures. Love it. I think I would have painted the legs to match the table but overall a good job. Like the paint color. Kathy, I love the colors, the styling, and your choice in projects. It is an amaaazing makeover!